When Maryam was 6 months old, I decided I needed to go back to work. At least part time, to give me some sanity, adult conversation and take a break from being a mommy for a few hours a week. Don’t get me wrong, I absolutely loved being a mom and Maryam was a dream child, still is. She slept all night, ate everything on her plate and never cried. I always joke that the amount Hassan cries in a day, Maryam has probably cried in a lifetime! I had a lovely nanny to look after Maryam, one I could really trust and I excitedly entered the workforce. But things didn’t go as planned. On my first day back, I just couldn’t concentrate. My shift was only 4 hours but I called home a total of 30 times. What time did Maryam wake? Did she finish her breakfast? What is she doing now? What snack did she have? Did she nap? How long for? Did she finish her lunch? The questions in my heart didn’t stop, nor did the phone calls. That night, as I held her tight and put her to sleep, brushing her tiny curls behind her ears that we fondly called her whiskers, I made the easiest decision I have ever made. And the hardest, if that makes sense. But the best decision as well. I could not work outside the home whilst the children were small. I just couldn’t. I couldn’t bare the thought of not being there everyday to see her evolve, to see her growing, be there to capture her firsts in my heart. Listening to her as her speech changed, her favourite toys changed, building her first lego tower and holding her hand through it all. However, I also quickly realised that I wasn’t the mom that loved to play. Whilst I could manage 15 minutes building a lego tower, another 10 baking a pretend pizza, I was never going to be the mother that played all day. I’d rather take Maryam to the park and push her in the swing or let her discover the slide and flowers and weeds and dewy grass beneath her feet. I’d rather be in the kitchen baking that real pizza. And so that is exactly what we did. Every morning, I would strap her tiny pudgy body into the bouncer and place it on our kitchen table, positioning her perfectly yet safely so she had the best view. I would go about creating recipes and havoc in the kitchen, describing my every move to her. As though I was a teacher and she my student. Sometimes I’d even pretend I was hosting a cooking show on tv and she was my audience. At times she fell asleep and I’d feel deflated but as she grew older her eyes grew more curious, her actions more animated. Sometimes I’d catch her playing with the flour that danced along with the light coming through our kitchen window. When she started to crawl, this opened up a whole new world of possibilities in the kitchen for her. Pots and pans were her favourite toys and emptying out the pantry was the best part of the day for her. I love that we can spend quality time together, both of us doing what we love. I love that I can nurture her love of cooking and baking. I love that she helps to decide our menu for the week. I love that she is willing to try anything, at least once. I love that face of anticipation and curiosity as she watches dough rise or batter cook in the oven. I love that excitement when she wants to decorate anything and everything pink, with ‘springles’ of course. As she wanted to do with these banoffee pie popsicles. She wasn’t too pleased when I thwarted her plan to cover them with pink shiny sprinkles. We settled on chocolate sauce instead. With her favourite biscuit in the whole wide world. Mine too- Digestives. The inspiration for these comes from the one ingredient banana ice cream posted by The Kitchn. We put our own twist to it and had such a fun afternoon decorating popsicles and photographing them. Baking has become a much sought luxury in our house. With temperatures searing, the last thing I want to do is cook, let alone turn the oven on. Besides, we just moved this weekend. For the 10th time in 12 years. I think I’ve become good at it, requiring only 3 days to unpack all my boxes. My mother in law has been kind enough to feed us during this time. Such a luxury it is to not have to cook sometimes. However, when it’s a tiny 4 year old with hungry eyes looking up to you and asking for a treat, you have no choice but to oblige. Last week, Maryam decided she wanted to fast. Seeing her enthusiasm, I didn’t want to say no. To the fasting as well as the cooking. Besides, I think it’s a good thing for her to become religiously aware so I agreed for her to fast till 1pm. I promised her a present and a menu decided by her. She chose a Minion Rush model, a water gun and a Hello Kitty puzzle. And to top that she also had her menu set out. Chicken nuggets with jelly and a strawberry cake. Thus began the task to bargain, on presents and menus. We debated whether she really needs three presents for a half day fast. Apparently, at four years of age, she does. After much debate, we whittled it down to a water gun. Perfect for the current weather. Of course, Hassan needed one too, fast or no fast. On to menus, turning the oven on was not an option. I kid you not when I say the temperature was 46 degrees Centigrade. ‘How about doughnuts? Strawberry doughnuts with springles’ as she calls them. Hmmmmm. It seemed the theme was strawberries….and pink! So we settled on this cheesecake. Well, it was a cake, it had strawberries but best of all, it required no baking. Maryam happy, mummy happy. The cheesecake was light, yet satisfying. The lemony freshness went harmoniously with the strawberries. And there were hints of pink and red. Trust me when I say everyone was satisfied. So proud of my little lamb! She now wants to fast again so she can get her Minion Rush model! Butter and line a 9 inch springform or loose bottom baking tin with parchment. Put the biscuits into a bag and pound with a rolling pin until crushed to crumbs. Pour into a bowl and mix with the melted butter until thoroughly incorporated. Tip into prepared tin, pressing down gently, and refrigerate until firm. About 1 hour. Place the cream cheese, sour cream, icing sugar and lemon zest into a bowl and beat with an electric whisk until smooth, about 2 minutes. Add the double cream and beat for a further minute or so until well combined. The mixture will thicken slightly but you don’t want to over beat the cream (the consistency will be like cake batter). Spoon the mixture on top of the biscuit base, making sure there are no gaps or air bubbles. Smooth the top using a spatula. Set in the fridge for at least 4 hours or overnight. Bring the cheesecake to room temperature before unmoulding. Use a sharp knife dipped in hot water and slice all the way round the tin in one smooth action. Open the springform and slip the cake from the base (it will slide easily because of the parchment) to a platter. You can also slide the parchment paper off if you wish. Combine the strawberries with icing sugar and let it sit whilst the cheesecake is coming to room temperature. When ready to serve, blend half the strawberry mixture with water until smooth. Strain and pour over cheesecake. Top with remaining strawberries and serve immediately. Notes: The amount of icing sugar in the strawberries will vary depending on how sweet your berries are. Make the strawberry puree on day of serving. Woah. What a few weeks it has been. Maryam finished school, I went to London, came back at the start of Ramadan and in between all that, I’ve been shooting images for various projects non stop. And loving it! It’s been a dream come true to collaborate with so many creative forces. But today I wanted to tell you about my trip to London. My beautiful London. It was my first trip without the kids. My first without a camera attached to my neck (so no London photos!). My first time to attend Food Blogger Connect. My first time walking the sunny streets of London on foot, eating the best local strawberries and visiting offbeat London flea markets. A holiday where I didn’t have a care in the world, for the first time. My first time in London where the sun showed its wrath all week. The first time I didn’t use an umbrella. That first moment when you meet someone at FBC that you have been chatting away with for eons over Twitter. So many firsts and so unexpected. What a beautiful week. It was also my first time visiting Brixton, a part of town I had never frequented in my 7 years of living there. And what a find for both me and the lovely Simone. It was packed with off beat restaurants and the whole vibe of the place struck such a chord. I wish I had more time to explore. To eat the luscious food. I’ll surely be visiting again. And this prawn cocktail. Well, it was a first for me. Not to eat but to make myself at home. One of those meals you think is hard to cook but really, comes together in minutes. So cool and refreshing. Wouldn’t have been out place eating this packed in a picnic box under a tree in Hyde Park. Early in May of this year, I travelled to Morocco for a blissful ten days. As with any holiday, if my room is good and I can find traditional and authentic food to fill my belly, I can rest assured that my holiday will be a success. After much searching, we settled on the boutique Riad el Fenn, a charming boutique riad nestled in a bustling corner of the old medina. It did not disappoint. When we first arrived, I was a little concerned by the looming dark entrance. But once inside, it was an oasis of tranquility. The art filled retreat was beautifully decorated in the most saturated shades of terracotta and turquoise. Each room was filled with quirky details, eclectic art, local decor. I only wished I had gotten to stay in a different room each night. Every morning, we would be greeted by hot tea placed outside our room. This would be accompanied by a small tray of home baked Moroccan sweets. Perfect start to the day, no? Lazy breakfasts of berber pancakes and cinnamon porridge were had on their rooftop terrace which had views of the Koutubia mosque and it really was the most perfect spot to catch the sun setting every evening. They even had a family of turtles housed in the courtyard that kept both kids highly entertained. One of my favourite things to do was recline on the large oversized cushions in the courtyard and gaze up at the overgrown citrus trees. Full of ripe oranges and lemons, their heady scent filling the air. Bright pops of orange and yellow against the blue spring skies. Every morning, Maryam would count how many had fallen to the ground and proceed to collect them. What Maryam and I, even Hassan, looked forward to most was chomping away at the home baked cakes and pastries every afternoon with a steaming cup of mint tea. Every afternoon, the treats were different and all housed in a beautiful bird cage. There was a pear tart, a luscious orange scented cake, baklavas and some dainty coconut crusted concoction. Ever since we have returned back, Maryam has constantly asked what ‘cake’ we would be having after her nap. Every single afternoon without fail. And so I thought it would only be fair if I made her one to remind her of the fun afternoons spent in the riad’s courtyard. This version has lots of coconut which pairs beautifully with the tart berries. Now if only I was sitting in in orange scented courtyard with a local cup of freshly brewed mint tea in hand and listening to the distant hustle and bustle of the city of Marrakech! Preheat the oven to 175 degrees Centigrade and butter and flour a 10 inch baking tin (I used two 7 inch pie tins and had extra batter leftover for 4 cupcakes as well). Using the paddle attachment of your stand mixer, beat butter and sugar until light and frothy, about 7 minutes and on medium speed. Add eggs, one at a time and scrape the bowl now and then. Mix the flour, salt, baking powder and shredded coconut in a separate bowl. Mix together the coconut milk and vanilla extract in a jug. With the mixer speed on low, add the flour and coconut milk alternatively. Pour the batter into the prepared tin (or pie tins) and top with raspberries. Bake for 40 minutes if using the 10 inch baking tin (25 minutes if using 2 pie pans) or until a skewer comes out clean. Cool on a rack. Decorate with more berries and a sprinkling of icing sugar and serve with creme fraiche on the side. I photographed these burgers in February. I had my fuzzy grey socks on with a hole where my little toe sticks out. Maryam likes to play ‘this little piggy’ with it when I wear it. It was just overcast enough to naturally diffuse the sunlight but I had to work fast to race against the dying light though. All it wanted to do was play peekaboo with the clouds. That evening, we had an early dinner in the garden. The kids ate their burgers whilst digging for diamonds in the sandpit. Hassan buried his lettuce in the sand and I’m guessing we probably had an apple crumble for dessert- still sat in the garden of course. Summer is finally here in Dubai! One thing remained the same though. These burgers still tasted just as good as they did in February…..anytime burgers really. This post centres around my recipe for a basic pizza dough. Or……it could also be about what to make when you feel down. Last September, when Hassan was only nine months old, we moved from a two bedroom flat to our current house. With an extra 2 bedrooms and an office as a bonus, it didn’t take long to get comfortable. Very comfortable. We quickly grew into the place. Day by day, the backyard grew greener. Our petunias sprouted and Hassan grew accustomed to his morning rounds in the park. Maryam made grand plans to paint her room……pink, of course. I kept telling her ‘we will, we will.’ But sadly, that won’t be happening as we will be moving again soon. Our landlord had decided he is renovating the whole compound and our contract won’t be renewed. I won’t lie- I was quite devastated. Moving has to be one of the most difficult things I’ve done (I’ve done it nine times!). Add two children to the equation and it makes it doubly hard. Plus I love this house, So many memories we have made in nine months. So many firsts for Hassan and already two birthdays celebrated in the house. I made this pizza whilst I was feeling down in the dumps. This breakfast pizza to be exact. Complete with eggs and sausages. Oh yes. Lemony arugula and parmesan to top it off. And you know what? It did the trick. Yup. It certainly made me feel better, more positive. Our bellies full and hearts content. So much so, that we have already found a lovely villa to move into next month. It will be just before I go to London for a week when I’ll be attending Food Blogger Connect. So much happening. I’ll keep you updated on our move. Excited. Note: I’m looking to update my blog design as well as creating a new web portfolio. If you know of someone, please leave their details in comments? Thanks! In a bowl, mix together the yeast, warm water and sugar. Set aside until frothy, about five minutes. Stir in the olive oil. Sift the flour into a large bowl and mix in the salt. Create a well in the centre and mix in the yeast mixture. Bring the mixture together with your hands to form a dough. Knead for five minutes until smooth and elastic. Put the dough into a greased bowl and cover with a damp tea towel. Allow to prove in a warm place for 45 minutes or so or until doubled. Heat a pizza stone in the oven at 250 degrees Centigrade. Meanwhile, make the sauce by heating the olive oil in a frying pan. Add the garlic and fry for 30 seconds. Add the tomato paste and chilli flakes and fry for a minute. Set aside. Wipe the frying pan clean and heat olive oil again. Add the sausage and fry, breaking up the lumps with a wooden spoon, until well browned. Dust your worktop with flour and place the dough on it. Punch it to knock out any air and divide into three equal balls (you will only use two balls for this recipe but you can freeze the other in an airtight container for up to a month). Roll both the doughs to a thickness of half a centimetre. Spread the sauce evenly over the dough, leaving a half centimetre border at the edge. Top with cheese followed by the sausage and onion. Break an egg into a bowl. Make a small well in the centre of each pizza and pour the egg into the well. Place the pizzas directly on the stone and bake until the base is cooked and the eggs are cooked to your liking. Top with arugula and parmesan. Season with pepper and serve immediately. It’s been a few days since we returned from Morocco. We are still jet lagged. Signs of our epic holiday show from the tans on our faces to the piles of laundry waiting to be done. We had a wonderful time touring Marrakech, Essaouira and Casablanca, mesmerised by the saturated blues and oranges on display. If you follow me on Instagram, you may have seen a few pictures of the sites that we discovered. Morocco has beautiful old buildings with terracotta walls. And oh the doors. Morocco has some of the most beautiful doors with every inch telling a story of its history. I cannot wait to share the photos of our trip and some Moroccan inspired recipes I know you’ll love. How does crispy fried sardines with herbed couscous sound? I knew you’d approve. But our holiday did end on a slight sour note when my little Hassoon brought back an unwanted souvenir from Casablanca. He has just learnt to walk and slipped in the bathroom, cutting his finger on a broken tile. Five hours later and with five stitches on his tiny finger, we were back in the hotel. Eight hours on the plane with a one year old in pain and a tired but hyper four year old was…….let’s just say trying. And tiring. So I was relieved to find some of these herby watercress and pea falafels in the freezer that I had made before I left. If you read my last post, you may remember me mentioning how hard it can get for children to try different leafy vegetables. Falafels are the perfect vehicles for them. I have experimented with various flavours ranging form spinach to broccoli. But this version is my favourite. Perfect for spring. Since Maryam is a a fan of peas, I just tell her it has peas. And it does. And so much more. Next time, I think I’m going to try and bake them to make them even healthier. Whilst she ate them as is, me and Akber wrapped ours in Arabic bread with a simple salad and tahini and yoghurt dressing. Such a good lunch. Soak dried chickpeas covered in water overnight. Make the dressing by mixing the ingredients. Set aside. Drain the water and make sure the chickpeas are completely dry. Add all the ingredients to a food processor and pulse until mixture resembles cous cous. Using your palms, create a patty in you hands roughly one inch in size. Press to smoothen edges. Just in case the patty doesn’t form because the mixture is too dry, add a tablespoon of water and pulse again in the processor. Freeze the patties for 30 minutes. Heat oil in a deep fryer on medium heat. Fry the falafels in oil without overcrowding until golden brown. To serve, spread 1 tbs hummus on arabic bread. Top with salad ingredients and pickle followed by broken falafels. Drizzle the dressing and serve. A while back, I received a lovely email from a reader telling me how much she enjoyed reading the blog. Not condescending in any manner, she told me that whenever she read a post, she thought about what a perfect life I had. A husband lucky enough to have a different meal on the table at least every couple of days. A sweet note to follow every meal. Model children who ate and polished everything on their plates including foods in brights shades of green. Could I give her tips? She imagined my house to be decorated in crisp shades of whites and beiges, not a toy out of place. Not a stain in sight, not a dish dirty. A picture perfect family, a perfect life. Perfect. As happy as I was to receive an email from an avid reader telling me she enjoyed reading the blog, the email left me feeling apprehensive and scared. Apprehensive that I would fail to live up to every reader’s expectations. Scared of failure. Scared to think that anyone can think I am perfect. One who is perfect never fails right? The pendulum between these two emotions, of perfection and failure, is one that I face everyday. Every moment. Not just as a blogger, a recipe developer and as a photographer but also as a mother and wife. Yes I do have a perfect family. A wonderfully supportive husband and two healthy spritely children. To me, that is the most perfect life ever. The two most important things. Ever. And I’m grateful. Very. However, life is far from perfect. If you walk into my home on any given day, chances are the door may not open. You see, Hassan has a habit of cramming his toys behind the front door. Oh yes, you’ll have to use the kitchen entrance. Which means you’ll be greeted by a pile of dirty plates in the sink. Anyone with toddlers knows, there are ALWAYS dirty dishes in the sink. Not because my children eat wonderfully healthy foods at every given moment in the day. Oh no. It’s because as a mother, you are always trying. Trying to get your children to eat three meals. Trying to get them to eat healthy. Trying to give them a varied diet. Trying to get them to just try. Trying to get them to finish. Trying……yes it’s a trying job. And that’s one of the reasons why you may see shades of beige on my wall. Where food may have been flung in one of those trying episodes. Ouch…..what’s that I hear! Oh sorry, you probably stepped on a sharp piece of lego. Yes, those deadly beasts are scattered everywhere. A few are though. When they ask for seconds, you know you have a winner. Then you sit down and photograph. It’s at this moment where that feeling of failure hits its peak, but also the desire to be perfect. Every image always has something wrong. A herb out of place, a burnt edge showing. Perhaps the image is not sharp enough, the color scheme not right. The shadows too harsh. The image looks flat. is it overexposed? It doesn’t convey the right mood. Should I just scrap this? Let’s just say it never is perfect. The perfect blog post, the perfect meal, the perfect recipe, that perfect image, the words or story that sounds just perfect. Maybe that’s why I tend to blog in my head more then on screen. In my mind I can imagine that beautiful lit image with just the right amount of shadows. A compelling story to accompany that elusively perfect recipe. Oh of course, just the right props. Imagination is such a wonderful thing right. However, there would be no blog if that moment of perfection is coveted. Perfect is not always possible. And that shouldn’t be our aim. If you are honest, you will find in that perfection. Just like this rhubarb curd I made. It was the perfect curd. Velvety smooth, just the right hint of tartness. Then I made it again. The rhubarb wasn’t red enough and so the curd of a ghastly shade of orange brown. Hardly appetising. Not to mention the bits of scrambled egg in it. Total failure. But that’s OK. If you succeed each time, you will stop trying. And if you stopped trying, you would stop creating. Does the idea of perfection and failure scare you too? *On another note, I’m off to Marrakech tomorrow with a few days in Essaouira. Any places I must not miss? You can also follow my travels on Instagram. I can’t believe it’s been nearly a year and a half since I last baked a banana cake. I was six months pregnant at that time and it was a craving that led me to bake one of my favourite cakes. Since that time, many things have changed. Our family has grown and is complete. We moved to a bigger house to accommodate this- and my growing collection of props. Maryam started school and Hassan learnt many new things. I worried for the longest time when he didn’t sit till nine months. Now he tries to climb into Maryam’s chair and sit, just like his big sister. He crawls and cruises and has the most headstrong personality a fifteen month old could ever have. It is highly amusing to see him throw his head back in anger and then bury it between his legs when he doesn’t get his way. Terrible twos already? I finally have a garden although it still needs some love and attention. A few more plants and flowers to add colour and perhaps even a herb garden at some point? I’m being rather optimistic I think. But one thing that hasn’t changed is my love for banana cakes. Oh yes, I still have a thing for them. Here I have taken that same cake I baked whilst pregnant and changed it to suit our current cravings (Oh and I’m definitely not pregnant). Added some chocolate and hazelnut butter and finished it with some chopped toasted hazelnuts. We devoured it together. Me, Maryam and my little Hassan as well. Good thing it makes two loaves so we could share with friends too. Extra chopped hazelnuts for garnish. Preheat the oven to 175 degrees Centigrade. Grease and flour 2 loaf tins. Mash bananas mixed with lemon juice and set aside. In another bowl, mix together the flour, baking soda and salt. Set aside. Using the paddle attachment of your stand mixer beat the butters and sugar until light and fluffy. Add the eggs one at a time. Add the vanilla extract. With the mixer speed on low, add the flour mixture alternating with the buttermilk. 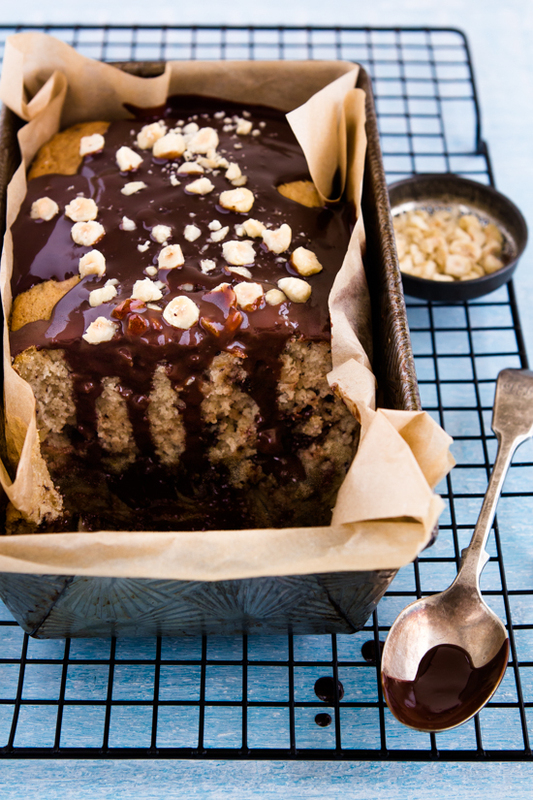 Stir in the mashed bananas, chopped chocolate and hazelnuts. Pour batter into prepared pans and bake for 1 hour or so or until a toothpick comes out clean when inserted into the middle of the cake. Frost when completely cool. To make the ganache, bring cream to a boil. Turn the heat off and add the chocolate chips. Let it sit for two minutes. Add butter and with a wooden spoon, mix until smooth. 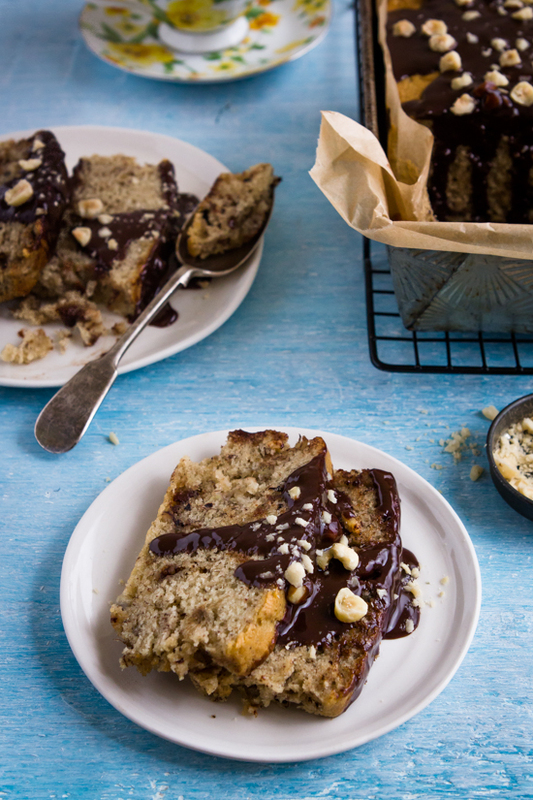 Frost cooled cake immediately and garnish with extra toasted hazelnuts. There are times when recipes take many hours of testing, much research, abundant time in the kitchen spent trying to perfect them. Ingredients bought many times over with numerous trips to different supermarkets to get just the right brand of chocolate, that perfectly formed tomato, the crispest herbs, the best looking berries. Amounts and measurements jotted, crossed, halved and multiplied on journals, colouring books and even the back of your hand. Complicated mathematics to get that perfect outcome. The kitchen may look like a whirlwind of activity with a thick dusty coating of flour covering the countertops. Butter smeared on every surface. All in the name of achieving that perfect outcome. Then there are times when it all comes together in a flash. All the right ingredients magically lined up on the counter begging to be used together. The show goes off without a hitch and every actor in the recipe plays their part flawlessly. Like today. The chocolate and peanut butter play their parts effortlessly, each supporting the other and yet stars in their own right. Cream brings the show together. My family gave this dessert a standing ovation and their were calls of ‘encore encore.’ For sure, it will be made again. In a saucepan, bring cream to a gentle simmer over medium heat. As soon as it’s simmers, take off the heat and add chopped milk chocolate and peanut butter. Stir with a wooden spoon until the chocolate has melted and is well incorporated. Set aside. In another saucepan, heat milk and brown sugar until it comes to a boil. Turn off the heat and add the gelatine. Stir until gelatine has dissolved and add to it the chocolate and cream mixture. Stir to combine. Grease 6 moulds lightly with oil. Sieve pudding mixture and fill moulds. Chill for at least 2 hours and serve with fresh berries.